Remember the two eggs Hubby found the other day in the big hen house? If not click here for the story. Since the chicks are all the same age, logic would say that all the hens will be laying very soon. Do the math... Never mind; I'll do it for you. Fifty new hens plus four older hens equals four and one-half dozen eggs a day! Of course, we'll be eating some of them, but even Hubby and his cholesterol club members can't eat that many! We plan on donating some to our city's food pantry, and we'll sell the rest. Hubby says that will pay for the cost of having them. Yeah, right. Did I mention our hen house has vinyl flooring? Sure, we bought it from the remnant rack, but it wasn't cheap! We did use recycled wood for most of the house, and the shingles came from everyone's left overs. (The roof is patchwork.) We used free telephone poles for the foundation. The door and windows are all free recycled goods, but the siding is purchased, as well as the floor and roof joists. On top of the building costs, you'd be surprised how much it cost to feed a bunch of birds! They need laying feed, scratch, grit, special things to put it all in. Don't forget the electricity for the heat lamps while they were young. Oh yeah, the fence... I think you get the point. Already we'd have to sell eggs for the rest of our lives to break even! Just when you think I've covered the expenses... Now we need something to put all those eggs in. People don'[t want to carry them home in Wal-Mart bags. 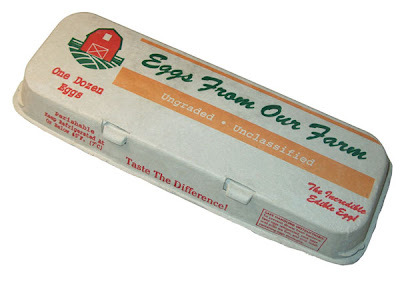 We only have about two-hundred saved, so last night I went online and researched egg cartons. They hatchery we bought the chicks from sell plain cartons for about 3.3 cents per carton cheaper than the printed ones from another supplier. (Would you believe eggcartons.com?) Hubby liked the printed ones. I don't blame him. They do look nice, don't they? I knew somewhere there was a window to heaven, but I didn't expect it to be a double-hung. This was our sunset last night. Do you see the center bar of the sash? I guess God wanted to keep out the flies and humidity. Every quilt they made was dated upon completion. This one is older than my daughter. I am so thankful to have this to remember them by. It was such an important part of their lives. They sat together, side-by-side in front of the quilting rack for weeks upon weeks. When the quilt was finally finished, they would put the rack away for a while. Next thing you knew, it was back! Oh my goodness! That is such an adorable quilt! When you have a quilt on your bed as beauty as that...you won't dare to sleep on that bed, I'll just enjoy staring at it. Haha. The egg cartons are nice but if it's cheaper to get a simple one then there's no difference as long as the eggs are fresh! That's the most important thing. I love the window to heaven photo. Very nice. You quilt is so pretty. I like the colors. Order those plain egg cartons and have the grandkids over and let them decorate them. It'll give the cartons a personal touch. Loved the window to heaven picture, I'm with Rae on the egg cartons. Never thought of that part of the egg business. When I tried raising chickens they turned out to be about 75% roosters during the worst drought and heat wave we'd ever had so I didn't worry much about egg cartons. The quilt is simply gorgeous, it is a work of art. My mom had a quilting frame set up out here when this was a garage. My daughters can quilt and they are in their early 30s. We don't quilt anymore but if we had time it would be fun. I absolutely love quilts. My mom used to collect them and when she died all her daughters split them up. Instead of saving mine, I used it up. It was not made as beautifully as this one, but I still get to enjoy Mom's quilts when I visit my sisters' homes. I also agree about the egg cartons, although I'm not sure I would have the kids decorate them... who knows what they would end up as? What a great post, so much information! I had no idea how costly it could be to get those fresh farm eggs. Good luck, I am sure you will sell them all. The sky picture is so beautiful and the quilt is incredible. I hope you are feeling better. The quilt is absolutely beautiful, the detail is amazing. I remember my grandmother sitting at her quilting frame which hung from the ceiling. I still have one of her quilts. I had no idea raising chickens was such an expensive endeavor, I wonder what the cost of one egg would be. Oh well, having farm fresh eggs is worth the expense. And I agree with everyone, go with the plain egg cartons. But you could have a label of some sort printed up to put on the cartons. It would be a less expensive way to personalize the carton. Very beautiful! I love the design,it must have taken a lot of effort to quilt.I love things that old ,adds value i think.